Is a tool, that you will be using for changing the visual of website. You can find it under Appearance->Customize in a admin menu or by clicking on customize after you activated theme. Then you could see the website with a fixed sidebar on the left and in it Theme Customizer options. There you can upload logo to your site. There are no restrictions but we higly recommend to upload .PNG with transparent background. By default there will be name of your site in basic font. 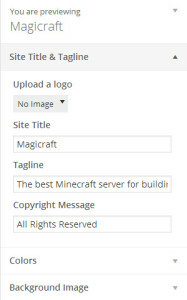 Write the short description of your server into the tagline for Search engines (Google etc.). At last write copyright message into the footer, that will be shown with current year. In Colors section you can change the colours of the site. If you click on the color, the color selection will drop down so you can mix your own colors. Also it is possible to write hexa code or you can anytime reset to default one. 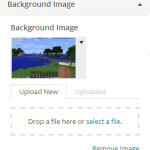 There you can upload a background for your page. Once you choose image more options will appear. In Skin section you can choose from installed skins. 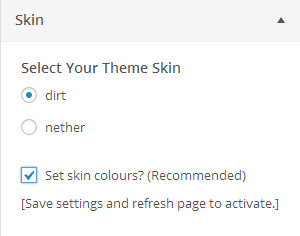 There is a options to set all colours to match the skin you selected, we higly recommend this to get full experience from that skin. You still will be able to change it anytime later. Because changing skin changes the core of a theme, it is necessary to Save & Publish the changes and refresh browser to see the changes. There you can change the layout of site. Check if you want to have a slider on the main page. Change sidebar position. Change the width of widgets in footer (this change goes into the core of theme, so it’s necessary to Save & Publish and refresh browser to see the change). In Font Options you can set font, that you want to use and also you can change the sizes of text and headings. It is common that different font fit different size. 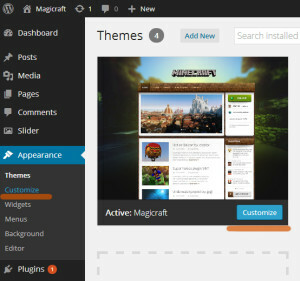 Don´t forget to save the changes that you made by hitting Save & Publish button in top right corner of Theme Customizer.